The only Europeans to ban glyphosate (the main active ingredient in Monsanto’s herbicide roundUp) and its dangerous additions (surfactants) thus far are the Dutch, with Brazil and France to follow. Yet Germany, keeping their evidence of these toxic chemicals secret, pressures EU regulators to allow these unhealthy compounds to be sprayed liberally over the continent. These surfactants, apparent in formulations called Rodeo, Accord, RoundUp, and RoundUp Pro, along with other glyphosate formulations, are extremely dangerous. Rodeo/RoundUp are aqueous solutions of the isopropyl amine salt of glyphosate and other chemical adjuvants. The herbicide glyphosate has been deemed ‘safe.’ but based on what? But an investigation of their newly published report shows that glyphosate is not safe at all, and important omissions were made. 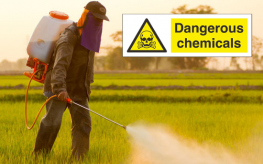 Though farmers and gardeners using glyphosate have seen it as a cost-effective way to control weeds, with sales reaching $5.46 billion in 2012 and expected to reach $8.79 billion by 2019, it is also heavily sold in other countries. In fact, glyphosate is now one of the most widely used herbicides in the world. The important distinction to make, however, is that it isn’t glyphosate alone that is being sprayed on crops, though this has proven to be toxic in its own right. (Acute toxicity levels have been found in many places around the globe.) Additional chemicals (surfactants) are always added to glyphosate to make it ‘effective.’ The chemicals deemed ‘active’ in RoundUp formulations are tested, but its full formulations are not. Most of us have or will ingest glyphosate in our lifetimes due to its prevalent use. It is so prevalent, in fact, that is is already being found in our blood, urine, and even breast milk. It is now sprayed over 80% of all crops in the U.S., leaving residue on many foods we purchase and eat. It goes without saying that RoundUp is also sprayed heavily on GM crops meant to be RoundUp ready – like soy, corn, etc. Many of the crops grown in North and South America and exported to the EU for animal feed are also doused in glyphosate and its surfactants. One surfactant in particular is drawing heavy criticism. POEA (polyethoxylated tallow amine) is likely very toxic to humans, animals and the environment. German authorities have taken their own protective action against this chemical, but the EU has failed to take any action whatsoever. Monsanto and Cheminova have tried dismissing the alarms sounding over POEA. For over a decade, the German Federal Institute for Health Protection of Consumers and Veterinary Medicine (BgVV) has requested Member States in the European Union not to accept glyphosate products containing the surfactant based on high cytotoxicity of the compounds. No surprise, though – Agro-Chemical companies continue to manufacture and sell products containing POEA. The high standards he speaks of are absent since there have been no independent studies on glyphosate and its surfactants since 1999 that claim it is ‘safe’. In fact, a paper by J. M Brausch et al. in 2007 “found all POEA formulations to be extremely toxic”. When German regulatory bodies requested more information on POEA, biotech gave them nothing, so they conducted their own studies after a German forestry worker developed a lung condition, and found that the “toxic inflammation of the lungs” was significantly different from a bacterial infection. Since then, the German Federal Institute for Risk Assessment and other German safety authorities published their draft re-assessment report (RAR) on glyphosate and the representative formulation, in the process re-assessing hundreds of studies and public domain literature (as mentioned earlier). And the Germany Environmental Agency (UBA) has included a chapter called ‘Further toxicological data for other potential co-formulants’ about the surfactant POEA to make sure all Member States of the EU are informed that nearly all toxicological endpoints investigated are clearly more toxic than glyphosate alone. By the end of this year, all formulations containing POEA will have been removed from the German market. So why exactly has Germany now changed from banning glyphosate to simply ‘restricting’ its use? German authorities have declined to release; however the list of companies that had to replace POEA, and what surfactants are now used instead, claiming this information is ‘industry protected’. I guess the rest of us are meant to swallow POEA, along with glyphosate, and just wait and see what happens. What a farce! The Monsanto formulations remain secret. Due to ‘data confidentiality’ we are not allowed to know just how toxic these chemical combinations truly are. How can you regulate a pesticide/herbicide industry if the public and regulatory agencies don’t even know what is in the chemicals sprayed on our food?